After five dry and mostly sunny days, the weather forecasters had finally begun promising a collapse in our weather. Sometime in the afternoon, a nasty low pressure system hovering somewhere near Cornwall was going to bring wind and rain. However, the morning dawned sunny so we thought we’d make the most of it while we could by walking east along the coastal path from Looe to Seaton. Starting at our camp site, this would be another round trip of about 7 miles. 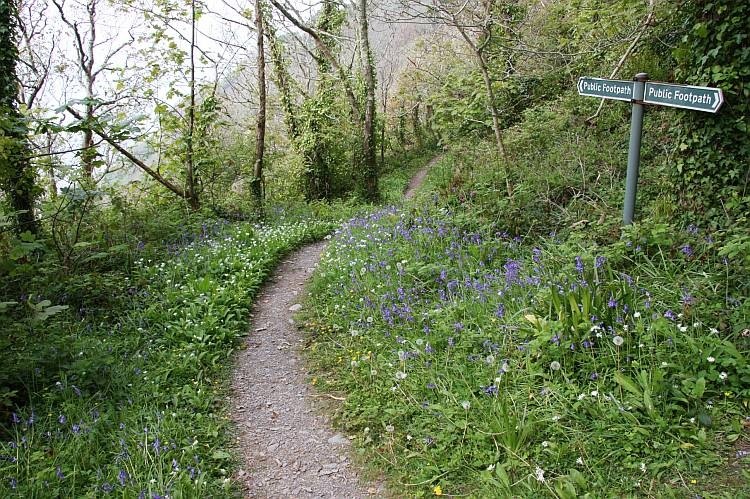 Joining the coastal path at Millendreath, we received something of a shock. We can’t remember seeing such a depressed and depressing looking place. A so-called holiday village clung to one hillside but looked more like a prison camp than anything else. Right down by the beach, what seemed to be the only two commercial properties around had been boarded up so presumably the inmates of the holiday village couldn’t have been enough to support businesses. The few private houses on the opposite hillside were littered with cars and vans in various states of disrepair inventively blocked up on wood, bricks, tyres – anything but jacks or axle stands, really. Even the car parking areas looked derelict. We were at a loss to see why a generally sheltered south-facing bay such as this should have suffered such a fate. Undaunted, we continued to the coastal path which proved more strenuous than expected by being something of a roller-coaster of a route. I lost count of the number of ascents and descents we made. The atmosphere was incredibly hazy so our cameras were more or less along as baggage just to make the ascents more challenging. 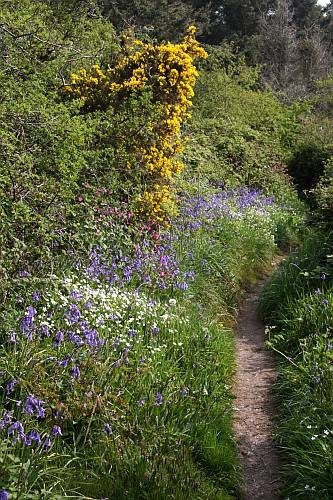 The route was otherwise unspectacular with the coast often hidden from view, though it did pass through some pleasant wooded areas or by the occasional splash of colourful spring wild flowers. Having been on the coastal path for a mile or so and with no junctions in sight, it was particularly reassuring to see a completely superfluous “public footpath” sign where there was no possibility of deviation. How thoughtful of someone. Seaton restored our faith in Cornish bays. Here, in stark contrast to Millendreath, was somewhere that was loved and tended with cared-for property and kempt lawns. I could have murdered a pint after all our wandering up and down and there was, indeed, a pub but with traditional bad timing we had arrived before midday so salvation was not yet available. There was, though, a pleasant enough cafe with tables overlooking the beach and surf so we opted for some coffee. We’d have opted for a Cornish pasty, too, but it transpired that we had stumbled across the only cafe on the Cornish coastal path that didn’t actually sell pasties. Fortunately, Seaton also had a more appropriately stocked corner shop to correct the deplorable oversight. We simplified our route back by sticking to a country lane with a single long climb up followed by the associated single long descent. We couldn’t avoid a second trip through Millendreath, though.